Iron ore and gold led the mining sector up this week, one by accident, the other by sheer force of investor demand. Iron ore was the accidental winner after a second tailings dam collapse in Brazil with a heavy loss of life and a devastating effect on the share price and reputation of that country’s national mining champion, Vale. Gold was arguably subject to more significant and longer-lasting influences which have reinforced its already strong investment appeal, with developments that included reports that the US interest rate cycle might have peaked, followed by the release of two investment bank reports tipping a surge in merger action. More on gold later, including a peek at a Macquarie Bank report which reckons “merger mania” has been unleashed which will dramatically change the shape of the industry with a number of small-to-medium Australian gold stocks in the takeover crosshairs as the major producers pair up. Iron ore, which had been expected to fade as China buckled under the impact of its trade war with the US, is enjoying a born-again moment as Brazil contemplates what to do with Vale, which was once a government agency, but is now a miner with a bad reputation. Apart from killing at least 80 people, on top of the 19 killed in an earlier dam collapse, the latest incident threatens to trim global iron ore supply and change the way Vale operates its wet-processing mines, including the re-location of tailings dams which will see some mines temporarily closed. Events in Brazil saw the benchmark price of iron ore rocket back through the $US80 a tonne mark to last be trading at $US82.53/t with forecasts of $US100/t in the aftermath of the Vale disaster. Australian iron ore miners, which process their iron using dry techniques, have been thrust into the spotlight as safe sources of ore, with Fortescue Metals Group and Mt Gibson Iron the major beneficiaries of Brazil’s misery. FMG was the biggest winner during the week, rising by 16.7% to a 12-month high of $5.65. Mt Gibson gained 10% to 64c. Rio Tinto was up 9% to $87.05 and BHP rose by 6% to $34.83, perhaps held back by its involvement in the earlier deadly Brazilian dam burst. 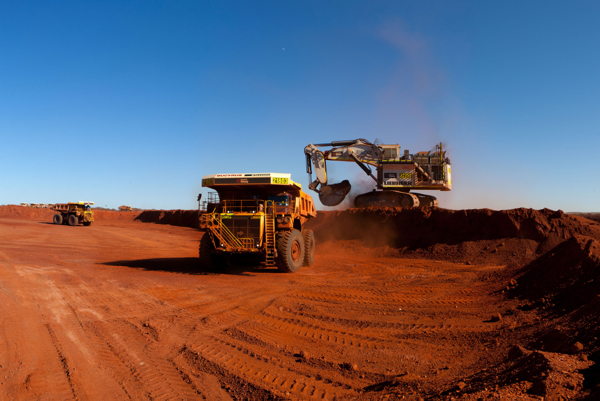 Whether the iron ore stocks can hold onto their gains, or whether the iron ore price can keep rising, are issues which will be closely watched. But investors would be wise to recognise that overall iron ore supply is unlikely to be significantly affected and the price could fall sharply if Vale can restore normal production. Gold is in a different category because it really does appear to be poised at the foot of an escalator, if not in terms of its price, then in terms of a scramble for assets and merger partners. Canadian investment bank, BMO Capital Markets, kicked the merger and acquisition ball into play with a report titled “M&A ideas for large producers”, a document which has its genesis in the mega-merger of Barrick and Randgold and the impending mega merger of Newmont and Goldcorp. Top of the next wave of M&A deals, according to BMO, is a potential deal between two South African-rooted companies, AngloGold Ashanti and Gold Fields (despite official denials from the companies), and Australia’s Newcrest with Canada’s Agnico Eagle. Macquarie went much further in its speculation about M&A deals and targets, including a comment that not only is merger-mania here, it is necessary to “save the sector”. The Macquarie argument is that the gold sector is too fragmented and desperately needs consolidating or risk losing even more investment appeal to institutions which have switched their gold exposure to exchange-traded funds (ETFs) and royalty streams. “Right-sizing of the sector should lead to a new cycle of acquisitions, exploration and construction,” Macquarie said. “The producer universe is starved of investable producers”. ETFs accounted for less than 2% of gold investment in 2008 but now represent around 10% of the market. Royalty streaming companies have risen from near-zero to a 17% share – with funds going into those products being missed by the gold miners. Consolidation is coming, Macquarie said, with its top picks among the companies likely to lead the mid-tier merger push being North Americans Kirkland Lake, SSR (formerly Silver Standard), B2Gold and Australia’s Northern Star Resources. Top targets include North Americans Gold Standard, Pure Gold, MAG Silver and Australians Gold Road and Dacian Gold. Overall, the Australian resources sector had a solid week with the divergence of key indices telling the story. While the all ordinaries crept up by 1%, the gold index rose by 5% and the broad-based metals and mining index added 7%, thanks largely to the iron impact on the majors. Dacian Gold adding 25c to $2.60 after it reported strong gold production in the December quarter, and perhaps thanks to its inclusion in the Macquarie top targets list. Fortescue Metals rising by 16.7% to $5.65 (as mentioned earlier) with part of the lift coming from the Brazilian-caused iron ore price spike and part from a strong quarter of production at a slightly lower cost per tonne. Iluka Resources lead the titanium minerals sector with a rise of $1.19 (15.7%) to $8.70 after a strong finish to 2018 with increased December quarter production and a boost from higher mineral sands prices. Credit Suisse reckons Iluka is on track to deliver a share price of $11.60. Galaxy Resources disappointed the market with grade and recovery issues at its Mt Cattlin lithium mine in WA leading to a 13c share price fall to $2.00, but with trades on Thursday down to a 12-month low of $1.98. Syrah Resources was another battery-metal stock under pressure as it struggled to hit targets at its Balama graphite mine in Mozambique. The stock lost 40c (20%) over the week to $1.56 with its December quarter report described by UBS as one-step forward and two-steps back. Nickel Mines, which is developing a nickel-processing business in Indonesia, added 6c to 32c after it reported that progress at site was ahead of schedule. Alderan failed to impress with the latest drilling resulted from its Accrington project in the US, which returned modest assay results. On the market, the stock lost 6c to 10c. (Next week’s Prospector’s Diary will be a special report from the Mining Indaba conference in Cape Town, an event which draws a large crowd of European fund managers, partly because it is Africa’s biggest resources event and partly because the fundies are fleeing the northern winter. Their views on mining can move the market).